Next week is the start of Youth Art Month! 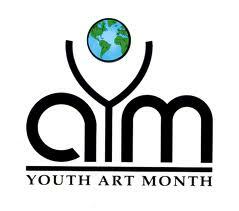 Observed each March, Youth Art Month is dedicated to promoting the importance of art and art education. Here are the Top 5 ways to celebrate Youth Art Month at your school and in your classroom. Open your doors – Invite parents into your classroom to be an assistant during a lesson. It is a good way for parents to see all the ways in which art is important in a child’s education. Put YAM on display – Create a display celebrating YAM in your main hall. It can be a bulletin board or display case. Include pictures of students working in the classroom and a description of what they are doing, include reproductions of famous artworks, and display children’s books about art and artists as well. Make a morning announcement – Speak about an artist each morning and add a quote by that artist to have added impact. See all the Quote of the Week Wednesdays for a great place to start! Create a featured “artist of the day” display. Something as simple as a large reproduction with five facts about the artist posted on an easel for students to see throughout the day. Advertise at home – Create a promotional flyer about the art department and what’s happening in the classroom. Include photo’s of students work (get parent permission first), quotes by students about what art means to them, information on local art museums…anything that will spotlight your classroom, and you, as a professional educator. What other ways do you celebrate Youth Art Month in your school?